In the spirit of repurposing, the Accidental Locavore is going to repurpose this recipe, one of my favorite breakfast/brunch foods and a great way to use up leftovers! 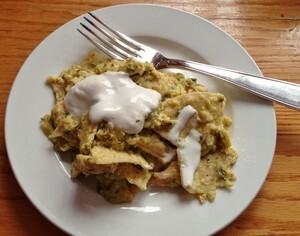 Still on my Mexican jag, chilaquiles are a mix of fried tortillas cooked with salsa and various add-ins. They’re super easy to make, essentially scrambled eggs with tortilla chips. Like their cousin, nachos, you can toss anything into them and they’ll taste great. Here’s the version I made for 1 person, but feel free to multiply and improvise. Start to finish this took about 10 minutes (not including the salsa). In a bowl, beat the egg, add the salsa, chips, chicken and toss to combine. Heat a large sauté pan over medium heat, and add the chip mixture. Cook, stirring until the egg is cooked and the chicken is warmed. To serve: top with the cheese, sour cream and cilantro. Serve and enjoy! Do You Obsess Over Grilled Cheese? What’s Your Favorite? The Accidental Locavore often wonders why people get obsessive about certain grilled cheese sandwiches. Is it just a competitive New York thing? 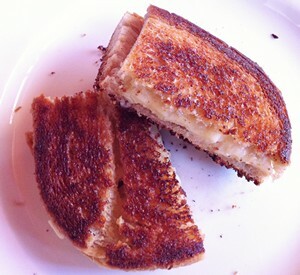 Not that I have anything against grilled cheese – it’s a great sandwich! It’s just that it’s not a big deal to make–two slices of bread, cheese, butter and a pan. Probably the second sandwich you learned how to make as a kid. So when I see restaurants, competitions and secret delivery services devoted to grilled cheese, it puzzles me, as it should be something that anyone can cook. When the Locavore makes a grilled cheese, these days it usually just comes down to whatever cheese is on hand, inside any bread that can be toasted and the results are pretty good as long as I don’t burn the bread. Having said that, there are grilled cheese sandwiches that stand out above the rest. One of the best was one I had years ago at Macy’s DeGustibus. It was a class of holiday luxury foods and believe it or not, the grilled cheese was certainly that! Sweet French butter on great seven grain bread with Gruyere and shaved black truffles. Bliss! 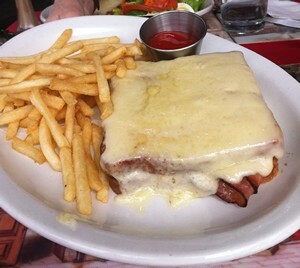 The one version of a grilled cheese that the Locavore does obsess over is that French classic, a croque-monsieur. Sadly, it’s something that is becoming harder and harder to find and most people, even in France don’t do it right. To me, the perfect croque, is made on the French version of a Pullman loaf, with Gruyere, a nice slice or two of ham and a slathering of béchamel on top, run through a salamander (broiler) until the cheese is melted, the béchamel is brown and bubbly and the crusts are almost burnt. Unexpectedly, an almost perfect version resides in a cafe in a Palm Desert (CA) shopping mall. My brother used to say that almost every culture has their own version of a grilled cheese. 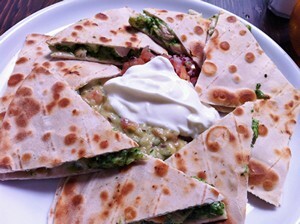 The Mexican version, a quesadilla, while not obsession worthy (too easy to do right), is fun to mess around with. Like a classic grilled cheese, all you need are flour tortillas, cheese, some salsa and anything else after that is up to you. Plop the tortilla in a frying pan over medium-low heat, add grated cheese to half the tortilla and fold over the other half. You can add your salsa inside if you like it warmed, or just use it for dunking when it’s done. I usually start with the tortillas, some grated queso quesadilla (sort of like mozzarella) and my salsa verde. If there is some chorizo around, that will get fired up and added. What’s your favorite version? French, Mexican, good ol’ American, or something entirely different?